The Federal prosecutor office of Ethiopia says it has found mass grave of 50 individuals in Somali region. Out of the 50 so far the prosecutor office has found remains of the 37. “It is not easy to find evidences for the crimes because the crimes were committed by the government and were well planned…It can be easily to collect evidences for crimes committed by individuals” said, Temesgen Lapiso, deputy director for cross border organized crimes at the federal prosecutor office. 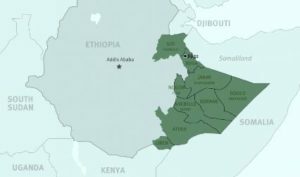 The prosecutor also stated that including properties of Ethiopian Orthodox Church in Jigjiga, houses of individuals and government institutions, over 412 million birr property is damaged as a result of the last July incident in Jigjiga city. The prosecutor has identified 46 individuals including the former president Abdi Illey for the crimes that involved government officials. It is indicated that out of the 46 suspects only six are now in jail while the remaining have left the country and hiding in the neighboring countries and within the country.